A modern bossa that connects several key centers. Transcriptions of Geoffrey's piano solos are available on both the original trio recording and an exclusive duo version with young bass phenom Daryl Johns. 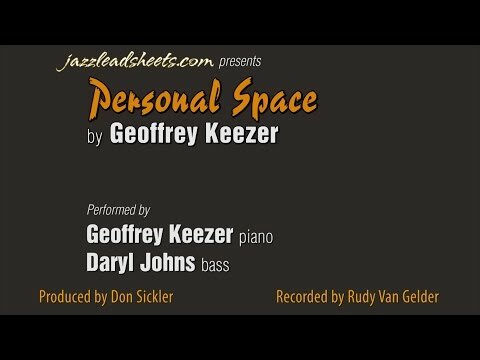 Pianist Cooper Lynn performs Geoffrey Keezer's Solo Piano Arrangement of Personal Space at the jazzleadsheets.com studio. This bossa is mostly in the key of A, but the lead sheet doesn't have a key signature because both the melody and harmony visit several other tonalities. The chord at the beginning of the A and C sections, though a tonic chord, is written as a slash chord—Fmaj7♯5/A —which is simply an A major triad with F added. The melody flows smoothly through the changes; the A and C sections are the same, and the melodies of the B and D sections begin with the same general shape as those sections. The B section has more II-V7-based changes than the rest of the form, while the five-measure D section (all other sections are eight measures) has ascending changes while the melody descends, leading to E, a pedal point vamp without a written melody. In this arrangement, Geoffrey starts alone with the E section vamp as an intro, as indicated in the lead sheet. The bass and drums enter at the top of the head. The ending also vamps on the E section. "Waiting In The Wings," Geoffrey Keezer's first album, was recorded when he was 17 years old. For more from this album, check out Pierce On Earth and Babes In McCoyland. From the liner notes, written by pianist James Williams: "Personal Space was penned for the trio only a day before the session. Geoff told me that the inspiration for this piece came from a recent composition of mine that I'd played for him at my home the previous day. The lyrical theme is pure and unpretentious, played with an airy, somewhat playful voice, suggesting childlike innocence as well as a quest for independence." James Williams first introduced Geoffrey to me at an IAJE conference prior to this recording. I was impressed by the depth of this young artist, even more so when I discovered that he wrote this great bossa in one sitting. Obviously, he was inspired. Bassist Rufus Reid fell in love with this composition: he recorded Personal Space seven months later, on his own album "Corridor To The Limits" recorded live at William Paterson University. This album featured veteran tenor saxophonist Harold Land, with Rob Schneiderman on piano and Victor Lewis on drums. For another treatment of this beautiful composition, click on the "Geoffrey Keezer - Daryl Johns Duo" album cover above. Transcribed Piano Solo Geoffrey plays two choruses here. The first [[clip]] is mostly melodic, with single-line right-hand melodies except in the second half of the A section and later around the D and E sections, in which a few right-hand voicings are added. There are a few sixteenth-note lines, but not as many as in the second chorus. His left-hand comping contains several passages in which a chord is held while the top note is rearticulated on the next upbeat; a good example is the chord on the "and" of beat 4 in the first measure. The first chord of the A and C sections is interpreted as A6(9) instead of the Fmaj7♯5/A indicated in the lead sheet. The second chorus introduces more right hand octaves and voicings in the B and D sections; for most of the E section, the right hand melody is voiced with in thirds and occasionally fourths. Geoffrey's solo piano arrangement showcases many of the rich voicings that can be generated from these changes. It is similar to the way he plays the melody in his original trio recording, updated with higher chords between many melodic phrases. Some of the voicings on the lower staff, such as in the first and fifth measures, have a wide range and need to be rolled or played with both hands. Geoffrey Keezer, piano, and Daryl Johns, bass, are filmed as they record Personal Space at the Van Gelder Recording Studio. Audio recorded by Rudy Van Gelder. 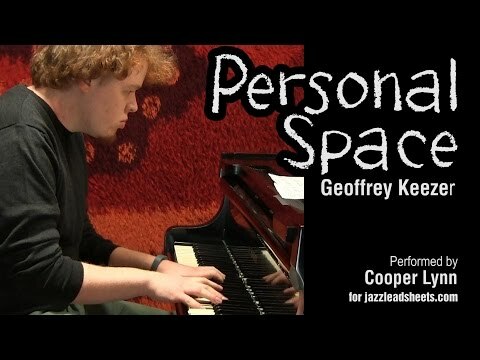 Pianist Cooper Lynn performs Geoffrey Keezer's Solo Piano Arrangement of PPersonal Space at the jazzleadsheets.com studio. This version starts with Geoffrey playing the intro chords rubato. The bass comes in with the melody, also rubato; Geoffrey sets up the tempo two measures before the E section. The tempo is considerably slower than on the original recording. The piano plays the melody in time, followed by one chorus of bass solo and one chorus of piano solo going directly into the ending vamp. We first met pianist Geoffrey Keezer when he recorded "Waiting In The Wings" for Sunnyside Records. Pianist/composer James Williams, who had recorded for the same label in the mid-1980s, brought Geoffrey to Don Sickler. Geoff (as we called him then) was just 17 years old, with amazing technique and great composing ideas. Don met bassist Daryl Johns, another young talent, when he was just 13. Daryl was 15 when he recorded with Geoffrey. After the duo session, Geoffrey recalled to Daryl that he also was deeply committed to music when he was 15. Transcribed Piano Solo On this recording Geoff plays one chorus clip after the bass solo, and then continues the ending vamp (the E section) for sixteen measures, ending the song on the last chord. This is a more two-handed solo than in the original recording; while it again starts melodically, the left hand contributes some harmonizations to his melodic lines, for example the triplets in the fifth and sixth measures of the A section. The left hand adds some counterpoint in the D and E sections, while the cascading runs in the sixth through eighth measures of the E section are occasionally two-handed. The last eight measures are particularly rhythmic, with some counterpoint involving ascending and descending lines in both hands on the upbeats. The final Fmaj7(♯11) chord is embellished with a series of thirds, fourths, and finally triads. With a not-so-small dosage of the ethereal, Personal Space is a melodic, harmonic, and compositional tour de force. Consisting of ever-shifting waves in a rich harmonic ocean, the chords require an intentionally aware sense of how to clearly outline. There needs to be immediate clarity, from bar to bar. Such a trait is very important for the improvising bassist, as often times bassists are tasked with fishing through murky waters and throwing gold back to the top for the rest of the crew to sell on shore. If the bass notes are ambiguous, out of place, or unsure of their implications, the hopes of success for the rest of the band will end up, like the Titanic—SUNK. Performers will come to greater understanding of such chords as Fmaj7♯5/A and B♭7♯5(♯9,♭9), broadening their harmonic palette and allowing for every musician with whom they work to have that much more support under them. The bassist is there to help the rest of the band sound as good as they possibly can, and a huge part of that lies in how the bass lines are constructed. Accurately timed roots and fifths are especially essential, as is the understanding that playing simply does NOT result in a loss for your personal creativity. A piece like this one brings out those kinds of commitments, for there are too many important demands for extraneous choices to be made. In addition, the lead voice highlights intervallic jumps, which open up a different dimension of melodic conception. A fun aspect of the bass is that you can shift across a few strings without moving your fingers much, and end up in another register! We think that after learning this song, you will find yourself checking out different ways to utilize these kinds of leaps in your own playing and will be pleasantly surprised with the range of results. Lastly, you will have an easier time with learning other new pieces, for the twists and turns presented here by Geoffrey Keezer will have likely prepared you for what comes next, and then some!